Here’s a silky 5 reel online slot game based around the ‘Aurora Borealis’, otherwise known as the Northern Lights. This is a beautiful online slot game with a floating gameboard that’s cast in front of a snowy Norwegian landscape at dusk. Spin your way through 5 reels of tribal foxes, owls and letters to earn some mystical rewards and bonuses. With an outstanding 300 fully licensed portals, NetEnt has undoubtedly created a strong foothold within the Casino industry. Establishing itself over 20 years ago, it has maintained a strong reputation with several online casinos. Over the years they superseded other casino industry giants such as Microgaming, IGT and Novomatic with their ability to keep up with the world of online games. They are also a well sought-after company amongst players as it is highly searched on internet browsers. 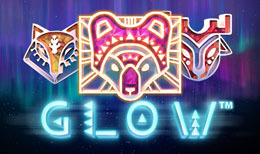 Aside from this, it has also developed many slot-games and one of their most recent slot-games, Glow, exceeds these expectations. Always wanted to visit the northern lights? Well now you can in the comfort of your own home with Glow. Set against the backdrop of Nordic’s beautiful natural setting, this 5-reel and 15 paylines offers a minimum bet of just 15p a spin with a maximum of £150 so there are opportunities for every kind of gambler out there! Your bank balance has the potential to glow and blossom wildly by the time you are through with this radiant slot-game! There is an abundance of creatures to draw your attention to as they will reward you with a range of bonuses upon discovering them. The bear symbol is the wild symbol and this will reward you with a x2 multiplier when it forms part of a winning combination of symbols. There is also a Free Spins Feature to enjoy which is activated when 2 or more symbols appear on the reels. If you discover 2 or 3 Moose symbols, 1 free spin will be given whilst 4 and 5 symbols rewards you with 2 and 5 free spins respectively. Additionally, if you land 3 of any animal symbols (Wolf, Owl, Rabbit, or Fox) you will acquire an additional free spin. Finding 4 of them will give you 2 free spins and 5 of them you will receive 5 spins! As an even bigger bonus, the ability to gain even more free spins is still active during the free spins, so you have the potential to create a continuous slot game, with all the fun and no reductions from your bank account are necessary, only replenishes! These woodland creatures also offer you up to 2,500x your initial bet. 5 Reindeer will reward you with 2,500x, Wolves will give you 1,000x, 750x for Mountain Cats, 500x for Owls, and 200x for Rabbits. This lavishing set of multipliers means you have a good chance of changing your pennies into a small fortune! The replenishment of free spins is our favourite feature of this game, it will get the point where you feel as though free spins are always being chucked your way! Not to mention, by the time you are finished with this game, it’s a nice added thought that you could afford tickets to see the real Northern lights, thanks to this game! Another game is waiting for you, Try your luck and play Golden Shamrock.